On the whole, salaries and hourly rates are up slightly for PR agency pros, in-house communicators and consultants, a new report from executive search firm Spring Associates says. The report looks at salary figures for 12 agency titles, five corporate titles and eight specializations categories, across eight key metro areas (NY, Atlanta, Chicago, Los Angeles, Boston, Houston, D.C., and San Francisco) and five regions (Northeast, Southeast, Midwest, Southwest and West). But while the numbers show a definite upward trend, that progress isn’t uniform. For instance, high-tech focused agency account executives in Washington, D.C. are on the upswing, with a 7.1 percent rise bringing salaries into the $59K-$77K per year range. But account managers in the health, medicine and pharmaceutical sectors in New York have seen average salaries slide 10.3 percent, hitting the $80K-$94K per year range. 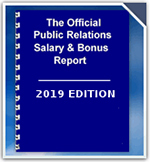 The Official PR Salary & Bonus Report, 2019 Edition, now in its 23rd year, does not rely on general surveys for its numbers. "Our data comes directly from vetted PR and communications professionals whose data are entered daily into our confidential, proprietary database of more than 22,000 individuals,” said company president Dennis Spring. In addition to salary numbers, the 16-page report looks at bonuses, alternative titles, PR firm billing rates, benefits and perks and consultant/freelancer hourly rates—all broken down into titles, specialties, geo locations, regions and segments. The report can be purchased at https://www.springassociates.com/.